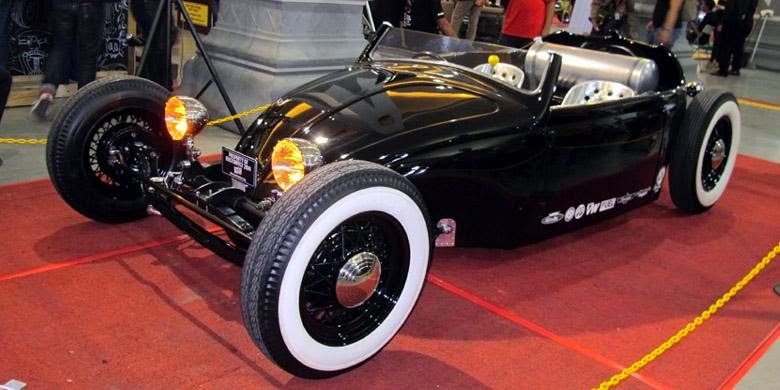 Hot Rod is one of the modifications line that adopt the American old school cars style with large engines. Now, the flow is becoming more popular in Indonesia. That is why, Lulut Wahyudi, CEO of Retro Classic Cycles (RCC) in Jogjakarta made ​​a special Hot Rod car to be awarded to the luckiest visitor at the Kustomfest 2014. After the process of working for 4 months, starting the concept, "sculpting", to finishing, finally a car without a roof was ready to be ridden and given a named The Cakil. "Its inspiration is drawn from the world of puppets ie the figure of Buto Cakil, a giant figure who has the character of grumpy, nasty, but has a determinedly to maintain confidence," said Lulut to Kompas Otomotif on October 11, 2014. The spirit of the giant was taken as an embodiment of the unyielding nature of the work, including to develop the Indonesian's custom world. Through The Cakil, Lulut want all involved in the world of custom to continue to innovate, persistent, and sure that one day, it would bring great benefits for whose involved. 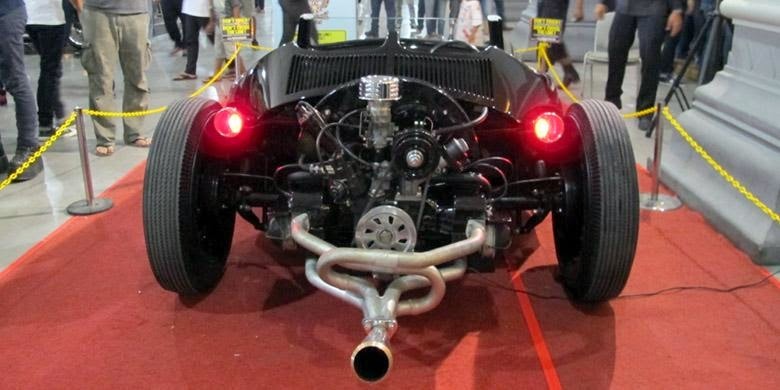 To power the Buto Cakil, Lulut entrust to the 1952 Volkswagen (VW) Beetle engine, with a capacity of 1,200 cc with a 4-speed manual transmission system. In the process of turned it on, he was helped by a friend who he calls Mr. No. While assembling the frame, floor, and upper body cuts made ​​by the RCC crew in Jl. Melati Wetan, Baciro, Jogjakarta. Upper body was cut, refined, and modified in such a way that short memorable. From the front still looks a little impression of the VW Beetle, it seen from the hood. But when viewed from behind, no more VW's characteristic seen. The figure is more boxy with 2 unique lights. The engine attached to the rear body with the elongated exhaust. Its construction is very detailed with a composition of 90 percent custom. Everyone who looked at this car could definitely seeing the inside of the car even its suspension. 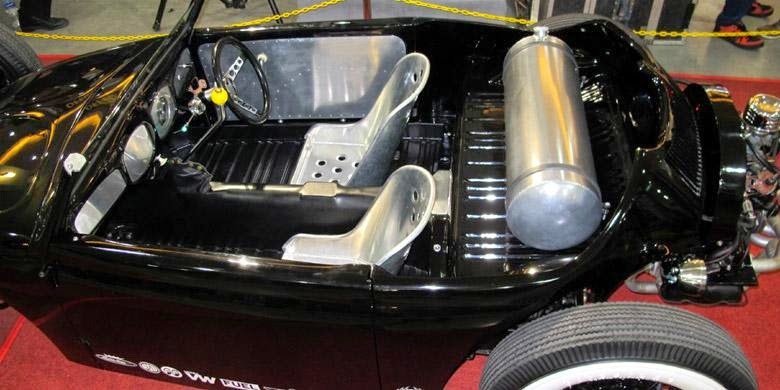 Some parts taken from the old-American cars, such as the headlights from a 1932 Ford, and the rear lights of a Ford pickup, until the steering and its suspension systems.